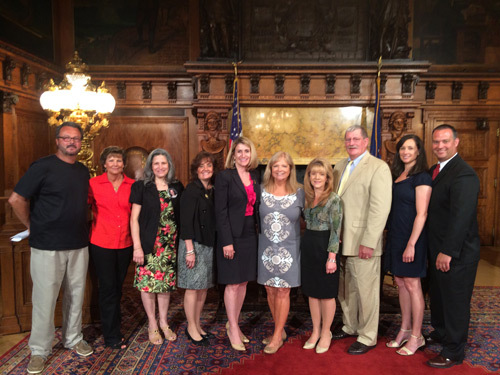 Rep. Rosemary Brown (R-Monroe/Pike) is pictured (from left) with George Over, Cristil Over, Rhonda Foster, Toni Pelligrini, Rachel Moyer, Lorraine Sikora, John Moyer, Christy Silva, and Steve Silva, after the bill signing took place on Monday, June 9, at the state Capitol. HARRISBURG – John and Rachel Moyer, residents of the 189th District from East Stroudsburg, lost their son, Greg at age 15 when he fell victim to sudden cardiac arrest during a high school basketball game in 2000. After Greg’s death, the Moyers made it their mission to get more automatic external defibrillators (AEDs) into Pennsylvania schools. Act 35 of 2014, legislation sponsored by Rep. Rosemary Brown (R-Monroe/Pike) officially became a law in April, and was signed by Gov. Tom Corbett at a ceremony held at the Capitol on Monday. Brown sponsored the legislation to establish a new AED program within the state Department of Education (PDE). The legislation directs the PDE to issue an invitation for bids every two years for the costs of the AEDs, in hopes of entities being able to obtain the devices for a lower cost. “I cannot thank the Moyers enough for their dedication to this cause,” said Brown. “I commend them for their aspiration to make our schools safer in this capacity, and for working proactively to ensure other families do not have to suffer the loss of a child to sudden cardiac arrest, when an AED at school could have saved their life. The Moyers have been instrumental in their efforts to help make a difference, and I am honored to help lead them to this achievement. For more information on Act 35 of 2014, or any state-related issue, contact Brown’s district office in East Stroudsburg located at 696 Seven Bridge Road, Suite 101, East Stroudsburg, by calling 570-420-8301. Information on current legislation can also be found on RepBrown.com and Facebook.com/RepBrown.